Back on October 5th we went down to Strites' Orchard Farm Market and Bakery for a family fun filled day! We arrived early in the afternoon and spent some time picking apples and then headed into the pumpkin patch to find the perfect Halloween pumpkins! This year the apples are fabulous and the pumpkins are pretty large! You can buy freshly picked apples too! You can pick your own apples every Saturday in October for $12.00 per 1/2 bushel. You can go into the pumpkin patch and find your perfect pumpkins for Halloween. The charge for this is 45 cents per pound which we thought was really reasonable. 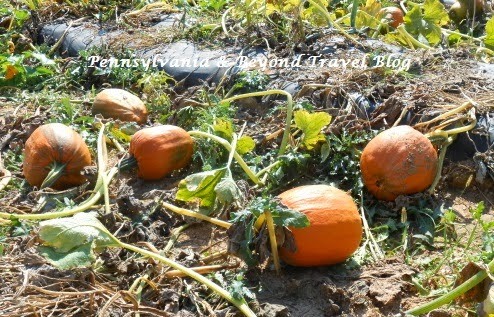 The Super Fun Pumpkin Patch! We picked two 1/2 bushels of apples and snagged ourselves 5 gorgeous pumpkins! On the Saturday that we were there they were running a special and if you purchased 4 pumpkins you got a 5th one (the smallest one in weight) for FREE. We made out pretty good and our little grand daughter had a blast picking apples and pumpkins! Once we were done we decided to go through their corn maze which cost us $4.00 per person. 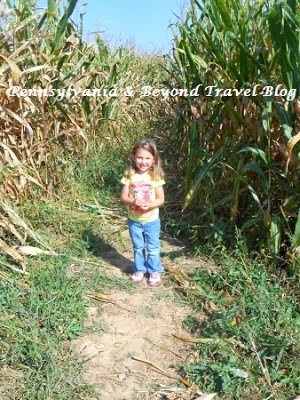 This was the first time our little grand daughter has ever been through a corn maze and she loved it! We appreciate that their corn maze doesn't have anything scary going on with it. It is just a simple corn maze for your family to enjoy which makes it perfect for families with little kids or for families who don't enjoy the spookiness of Halloween. After we finished up in the corn maze we drove the few yards up to the Farmer's Market and purchased some freshly made apple cider, potatoes, zucchini, green peppers, tomatoes, onions, grapes and some delicious peaches. Oh yeah, I can't forget that DELICIOUS pumpkin whoopie pie I got too! 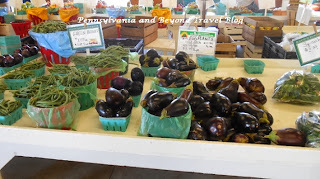 Our family had a great time visiting Strites' Orchard Farm Market and Bakery. We actually started a family tradition a few years ago and always go there for a visit the first or second Saturday during the month of October. We love getting together as a family and doing some fun Fall activities together. You can find Strites' Orchard Farm Market and Bakery at 1000 Strites Road in Harrisburg, Pennsylvania. You can visit their web site for further information on what produce is currently available, their hours of operation and driving directions.